Home / About us / What Is Puppy Pan? Puppy Pan is an innovative, new dog litter system especially designed to meet the needs of dog owners who require convenience and flexibility in managing their pets’ elimination needs. 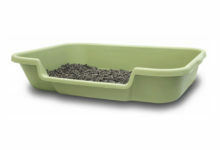 It consists of a uniquely designed pan, tested to easily accommodate dogs of a range of sizes and a specially formulated litter that is extremely absorbent as well as comfortable to the dog’s paws. Peck Rock Associates, a family-owned business providing custom designed and manufactures plastic items since 1969, is the manufacturer of this extraordinary puppy training system. Good elimination habits are essential for positive dog/owner relationships. The necessity for managing the most appropriate elimination time for the dog can become very stressful due to all the circumstances that can interfere with the ability to meet the dog’s individual schedule. This is where Puppy Pan can take the stress out of dog ownership! Dogs need to be taken out 3-4 times a day and puppies even more often. For dog owners with busy or unpredictable schedules, this issue can be a significant barrier to dog ownership. When asked, what is the favorite pet of American households, most will say they prefer dogs to cats. However, there are more homes in America with cats than dogs! This is undoubtedly due to the more demanding needs of dog ownership, especially in regards to waste management. Convenience for the Owner, Comfortable for the Dog! Puppy Pan offers an alternative that can be used alone or in conjunction with taking your pet outside, providing convenience and flexibility for dog owners. 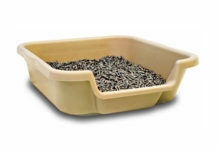 The Puppy Pan system is superior to other indoor dog systems because of our custom designed pan which meets the particular requirements of a wide variety of dog breeds. 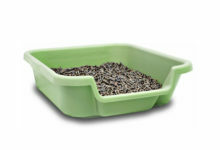 Unlike other pans, the Puppy Pan pan comes in two sizes to accommodate different breeds and can be used with environmentally- friendly litter, making it much easier to clean and more hygienic than other systems on the market.